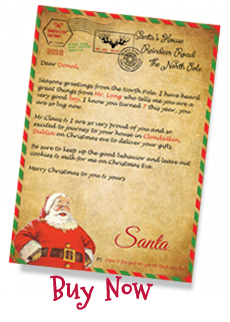 Get your very own personal letter from Santa Claus himself straight from the North Pole to your doorstep! We have 4 pre-defined texts where you can add details of your child’s best friend, school, pet, teacher OR you can “Create your own” letter making it 100% unique! Our letter has been exclusively designed for the Santa Experience and we promise NO ONE does a better letter! “Santa’s Nice List certificate” for only €3.00. Your child will be in no doubt that they are on Santa’s good list with their name on this beautiful certificate! Our double sided certificates have also been designed exclusively for the Santa Experience and are in keeping with our traditional authentic Christmas style. We guarantee satisfaction or your money back! Magical Reindeer Food €3.00 each- Rudolf and the other reindeer get very hungry on their journey around the world and Santa has given us the secret recipe for their favourite food to leave out on Christmas Eve so Rudolf knows where your house is. The Magical Reindeer food comes in a beautiful pyramid shaped box complete with ribbon to hang on your Christmas tree just like a Christmas bauble! This has been exclusively designed and produced for the Santa Experience! Be sure to hang the food on your tree until Christmas Eve and then sprinkle it outside just before bedtime!